I am trying to figure out why a site is being called with the wrong AD / Likelihood and what can be done about it. In particular, there is a site in my VCF that is being called with a very wonky AD value of 190,63, which is well outside the expected 50:50 ratio. The call in question is a deletion of 2 T's from a 7 T track (e.g. T -> T), and was made on a BAM file of a single subject using the haplotype caller with --genotyping_mode DISCOVERY and otherwise the default values. 3 - Assign each haplotype to one of the possible variants, take the highest "score" for a haplotype assigned to a variant, and make that the likelihood for that read/variant combination. However, this process seems to be flawed. Examining the region, it looks like the process that assigns haplotypes to variants (Method [email protected]:1043), assumes that if a haplotype doesn't have an event at a particular location, it sould be assigned to the reference. This however does not work when the haplotype does not match the reference at that location, which can occur for example if there is an upstream deletion that removes the reference sequence being considered. 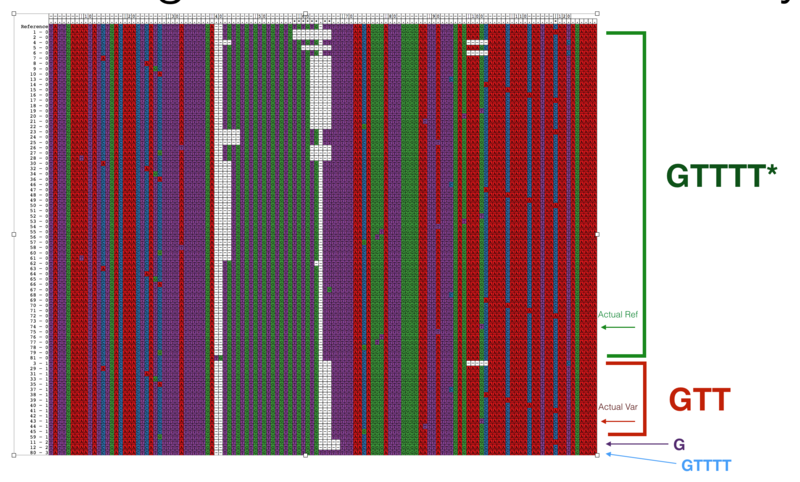 The graphic below shows all the haplotypes that were considered for each possible variant, clearly many things with the variant "TT" deletion are identified as being part of the reference, which seems to lead to skewed likelihoods and incorrect AD counts further downstream. Is this a known issue with the haplotype caller? And if so, are there any workarounds? We have heard of issues in repeat regions when using HaplotypeCaller. Those can usually be fixed by adding --allowNonUniqueKmersInRef to your command. Can you please post the exact command you ran and the version of GATK you are using. Please also post the VCF record in question as well as the bamout file.